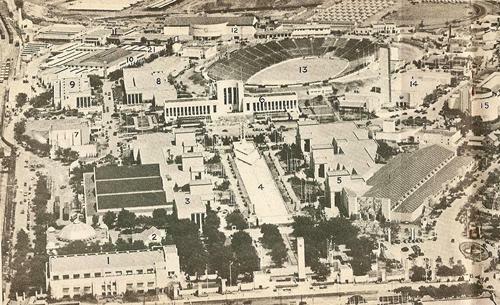 Dallas Fair Park - 33. Food and Fiber Building. 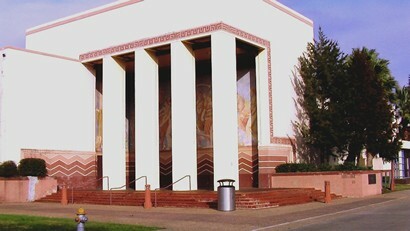 Originally built as the Agriculture Building for the exposition, the structure is now called the Food and Fiber Building. The interior covers an area of 25,000 square feet. Almost a duplicate in design of the Embarcadero, it houses a variety of features pertaining to the farming industry. Small stands throughout the vicinity allow local and state companies to sell their food products. 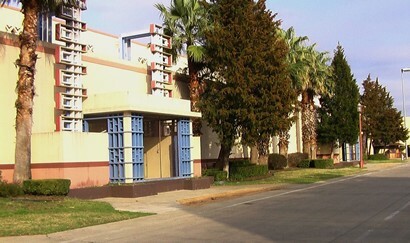 A general store in the center of the building allows visitors to purchase Texas-grown produce and other grocery items. There are also food sampling tables, an attraction that emulates a harvester machine, a gazebo for live performances, and a place to meet Elsie the Cow and her daughter Beauregard. Along the walls, visitors can view displays about agriculture on such topics as conservation, wheat, cotton, milk, pork, grain, and irrigation. All of this is only available during the fair. The rest of the time, the building remains an unused, empty husk. The current building was under the threat of decay and disrepair when a decision was made to renovate it. Part of the project involved the restoration of two murals which had been covered by several layers of paint. The largest of the two depicts a group of field workers and the other shows a young woman representing fecundity. Both were thought to be the work of Carlo Ciampaglia until later evidence showed they were the product of an Italian artist named Hector Serbaroli. He moved to Mexico City to decorate the Teatro Nacional, then traveled to America when a revolution arose. He worked on commissions in California and taught at the Mount Tamalpais Military Academy. Work on the building's restoration was completed in 1999. It involved strengthening the foundation, replacing the roof, and upgrading the utility systems. Once that was accomplished, workers repaired the plaster, repainted the walls, and fixed the windows. The murals were returned to their former glory in 2001. This marked the completion of the first restoration effort on a Fair Park pavilion.